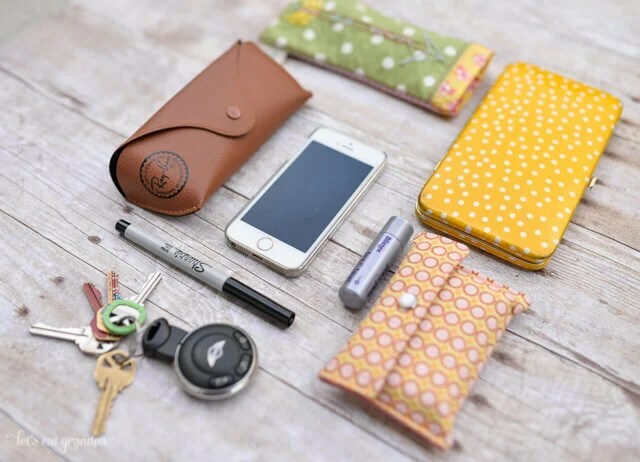 I’m kicking this organizing series off with a hot topic: how to stay organized on-the-go whether it be in your car, carrying your handbag around or managing your smartphone clutter. My secret to success is having LESS. It’s tempting to bring along everything you own JUST in case you need it. My husband uses his vehicle as a mini-closet. The reality is, the less you have, the less you have to organize. If you are following my Instastories (click on those little circles on the top for videos of my day) on Instagram you know that I spend a lot of time in my truck. I try to follow the “less is more” standard in my truck. The key to mobile efficiency is to first establish your everyday favorite go-to items and organize them within hands reach. My workdays normally span between 10-12 hours. With multiple projects and meetings each day I tend to really rack up the miles. Because I spend so much time in my car, I try to keep it neat and organized and only travel with items that I really love. At all times I have my favorite lip gloss, prescription sunglasses, notepad and pen, facial tissues, phone charger, and business cards in my console. This is a shot of the inside of my console, it’s simple and contained and I have everything I need with a quick reach. Gas stations always have a large trash can next to the pump, so take advantage of that extra few minutes you are waiting for your car to fill up. Establish a process for bringing items back into the house from the car. I have a client who stores a bin in her garage. At the end of every week she fills the bin up with lingering items from the car then spends 10 minutes putting everything back in it’s place. This process saves her time she would normally spend hunting for the missing kindle charger, her son’s soccer cleats, and her favorite coffee mug. Plan a simple emergency system for storing what you would LOVE to have just in case you are stranded or have car trouble. A flashlight, warm blanket, small stash of water, and some non-perishable snacks. Who hasn’t seen a handbag storage organizing tip? There has been a long list of handbag storage trends that attempt to help you stay organized from purse inserts to color changing clip-ons. The bottom line is that gals just want to carry a cute and functional bag without all of these frills. I encourage my clients to swap out their handbags a few times a month. And they always look at me with that worried look and say, “but that means I have to take everything out!” Everything, goodness, let’s take a look at what’s inside. I once had a client who was like a mobile beauty counter. Kendra had everything from concealer to mud masks to de-frizz products rolling around in her handbag. She was really attached to the idea of being prepared for every possible beauty emergency and the only reason she opened up to the idea of making a change was because of the neck and shoulder pain that it caused. Handbags can be heavy when they are full so you can only imagine how heavy this client’s bag was, it was like lugging a bowling ball around everywhere. Kendra started addressing the pain with physical therapy and I told her she was addressing the wrong problem. This is called deflection. All of us do it because it’s easier to address the issue on the surface instead of the issue lingering deep down. Kendra and I worked together for almost two years so I knew exactly what she was trying to deflect. After finding out what she was spending on physical therapy for her neck and shoulder issues, I brought it to her attention that the real issue was what she was hauling around in her handbag. I finally talked Kendra into tackling that handbag during an organizing session. When we pulled everything out it took up her entire 10-foot dining room table. Her handbag had become more of a safety blanket. We were able to circle most of the items back to her self-image issues. She had always struggled with her weight and appearance. The arsenal of weapons (beauty products) in her handbag would help her combat the feelings she “might” have during the day. She finally realized that her handbag was helping her mask some deep routed issues and was able to let go. She was also able to take what she learned from the process back to her therapist and continue to work on it. I know this client struggled with a deeper issues than many of us but we have all created some sort of arsenal in our handbags. Aside from the arsenal, our handbags are a gateway to our finances. Imagine if your handbag was stolen right now. Go through the exercise of making a list of what was inside. No cheating, just get that pen and paper out and start jotting things down. Now, dump everything out of your handbag. How many of those items were on the list you made? I’m guessing not even a third. The list that you made most likely contains what you’d LOVE to have in your handbag. The items that seem practical and useful on a daily basis. Everything that didn’t make the list probably doesn’t belong and it’s time to let it go. Purchase a handbag that you LOVE! I’m talking LOVE, LOVE, LOVE! I love a good handbag and I’ve been known to spend a lot on them. I have always justified this because I end up buying fewer handbags over time. I typically buy one new bag each fall and I use it through spring. I try to buy something that goes with everything I already own so I don’t have to swap it out and I can maintain a lean system inside. Spend 10 minutes each week purging the clutter that creeps inside. Open all of the compartments, get rid of those ATM receipts and gum wrappers. Open your wallet and do the same. I always take 30 seconds to organize my cash by type and in order. I’m a stickler for that but I think it helps me save money. I know exactly what I have with me and I never give out a $10 bill instead of a $1 bill. I might be more of a stickler for this because of having to watch people pull cash out of every crevasse, and I mean EVERY crevasse at our estate sales and liquidations. Have one small zippered pouch for beauty products. Keep it simple and stick to what you LOVE and use. I could probably write a 10 part series on how to organize your smart phone but I’ll cover it in a condensed version. We all have dozens of apps to flip through that snag valuable phone memory and take up time to find. Next time you have the urge to flip through Facebook, divert your attention to deleting apps that are no longer in use. You’ll be surprised that of what is hogging up your memory and your screen. Next, use a universal charger for your electronics and your smart phone to keep the cords to minimum. I have a universal charger in all of our work trucks so everyone can charge on the go. Spending the $10 per charger has paid for itself time over time and I love not having a bulk of extra cables hogging up my dash. Create folders for commonly used categories. Pairing down your apps from 6 screens to 2 screens will save you time and eliminate the technology clutter. Purge unused apps along the way. Back up your phone to your computer and delete photos regularly. Photos don’t do you any good on your phone and the honest truth is that you wouldn’t frame 90% of the photos that you take. So you really don’t need them! Simplify cords by having power stations in targeted areas. One in your car, one in your entry way… This will encourage you to live without your phone (more often) and have less cords around your house. We have 2 in the kitchen and one in each of our cars. I’d love to hear questions and ideas from you so please take time to comment here or on social media. The next installment of #livewithwhatyoulove is coming on Sunday. Stay tuned!